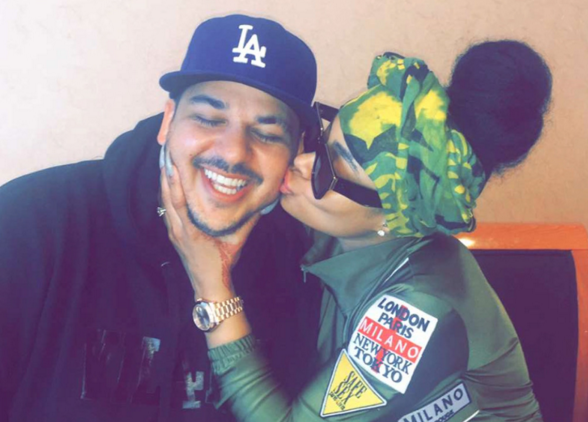 Los Angeles, CA, United States (4E) – Rob Kardashian and Blac Chyna have been in the spotlight for weeks now and just recently, the former uploaded a video in which the two can be heard looking at the food that he keeps in his home. It seems that reports about the model helping Kardashian get back in shape and trim down his weight are true as she raided his kitchen cabinets and fridge and showed the unhealthy things that he keeps and eats. Some of the foods shown in the video are rain forest crackers, I Can't Believe It's Not Butter, fat-free sorbets, oatmeal and more. Throughout the video, Chyna is heard continually saying “What the f**k is this” as well as “Nah” or “Nah man!” Kardashian is heard laughing in the background as she seemed disgusted with the foods he keeps. She ends the video of herself pouting and saying: "It's just sometimes in life you have to eat healthy." A source recently shared that Kardashian has been keeping tabs regarding his health as he wants to be healthier again after his diabetes diagnosis. An insider said that his fitness routines are much more consistent. It also seemed like Kardashian seems happier since he has been struggling with depression. He posted a photo of him smiling from ear-to-ear as she kissed his cheek. This was posted on her Snapchat account.